Balanced diet is something we tend to forget these days due to our busy lifestyle. Most of we stick to healthy eating when we are at home. But how are our food habits when we are in a hurry? The following tips will outline some simple ways to enhance your everyday health and sensible eating that helps to boost your metabolism and maintain a healthy weight. 1. Start your day with a wholesome breakfast: Go for complex carbohydrates, good quality proteins and essential fats before you begin your day's journey. 2. Don't super-size your meal. Choosing a regular-sized meal will provide more than enough calories, energy, and hunger satisfaction. 3. 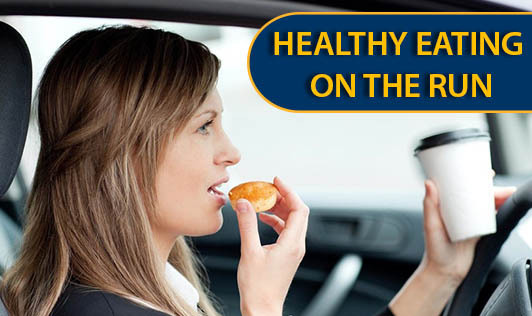 Keep healthy snacks in your car. If you are often travelling, go for fresh fruits or whole-grain nutrition bars so you can get an energy boost without being tempted by fast food. 4. Slash down your coffees and Teas: Remember to count your coffee cups. Anything above 3 cups can pose health risks! 5. Limit your alcohol intake: Consume it in moderation as this can dehydrate you. Choose healthy snack as its accompaniment to lower extra calories. 6. Carry healthy foods: Most packaged foods are loaded with sugar, sodium, preservatives and artificial colors and flavors. So, make a smart choice on the goods that you can carry. 7. Don't stuff yourself: Eat 80% of your appetite. Consuming more will load onto your calories. 8. Make "Must have veg rule": Whatever the foods you eat, ensure that you have a serving of vegetable as part of main and/or side dish. Even the smallest of veggie servings will help you in healthy eating. 9. Eat mindfully: Space out your meals wisely and be watchful on the quantity of consumption. 10. Stay hydrated: Always carry water with you to prevent dehydration. This can also cut down appetite. 11. Dine out smart: Choose the restaurants carefully and be particular about the toppings and extras for you main dish. 12. Remember to count on empty calories: Sodas, instant coffee drinks, and alcoholic beverages can add to your empty calorie consumption.